New book on knitting. . . I think I've mentioned my awesome library system before. Basically I go online and can search a bunch of libraries in Illinois. Then I "place a hold" on the items I want and they are shipped out to my local library. The local library call me and I go pick them up! Now this is an excellent use of my tax dollars as far as I'm concerned! You may want to see if your library does this too! So anyway, last week I was browsing the online catalog and came across a knitting book that almost looked like a text book to me. I hadn't seen it in the bookstores and I was really curious. So I "placed a hold" and was called a few days later. Wow!! The book is called The Art of Knitting and it was written by Francoise Tellier-Loumagne (in French originally, but it has been translated into English). The sub title is "Inspirational Stitches, Textures, and Surfaces" and that is a great explanation for what this book is all about. The basic format is this -- there is a graph with a basic stitch pattern, following that is a diagram of the pattern (this is in a format strange to me, but very useful in describing what the yarn "does" in a particular stitch pattern), then there is an illustrated representation of the knitted fabric. Next is the incredible part -- there are *numerous* photos of the stitch pattern knit with different materials including many different yarns and sometimes combinations of yarns. It is a visual treat! The book is massive with over 300 pages, 600 color photos and hundreds of diagrams. There aren't any "patterns" in here, it's more of a collection of ideas that will inspire and hopefully get you creating your own knitwear! Really -- check this book out! I think that you will be glad that you did! I'm going to post this over at Two Frieds Collect Books too! Thanks for all the great suggestions so far! 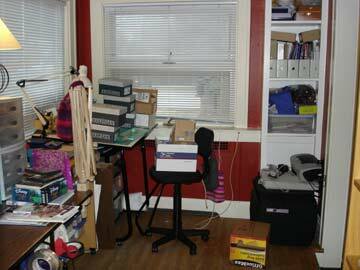 I'm getting good ideas and I've already done a bit of re-arranging and tidying up! My room is already pretty much organized, but it is not "pretty". Any tips on hiding the stuff I need, but making it accessible? I don't really have much to purge. I purge constantly. So I need tips for making things neat and organized. But the stuff that is there is pretty much necessary for the businesses and school. Here are the thing I have that must stay: computers (2), printers (2) (although could I get rid of a printer if I had a wireless router? ), scanner (although could I get rid of the printers and get one all-in-one printer w/ a scanner? The more I type the more ideas I get! 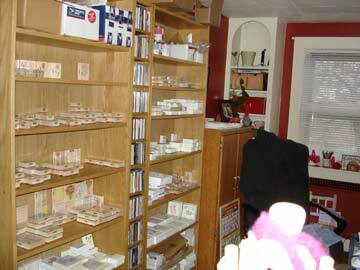 ), all stamps on the shelves -- which are for my online rubber stamp business (and while they look empty, that will change drastically in a couple of weeks when they will be overflowing with the 2006 stamps! ), a place for patterns -- which are for my knitting pattern business -- in various stages of completion (back from the printer, folded, photo attached), Maddie's school stuff. My furniture is so mis-matched! Do I have to buy all new? Is there a way to integrate some of what I have? 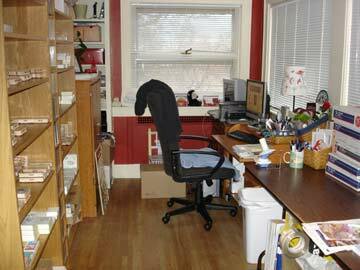 I've looked at IKEA, Pottery Barn, filing cabinets (topped by doors? counter tops?). So maybe by organization I meant hiding or camouflaging :) Or just making things match! Please keep sending me those ideas! I especially like links to sites / items / photos! Time for the traditional top 5 list. Now these aren't books written in 2005, they are my favorites of the books that I read in 2005. . . Snow Flower and the Secret Fan by Lisa See. I read this book back in September and I'm still thinking about it. You can see my original review here. Ireland: A Novel by Frank Delaney. Massive book that you can really sink your teeth into. I reviewed this one back in August. A Million Little Pieces by James Frey. I didn't read a whole lot of non-fiction this year, and I have to say this one reads more like a novel. You can see what I had to say about it in this post. The Heart is a Lonely Hunter by Carson McCullers. Yeah, another Oprah book club book. What can I say. . . she knows how to pick them! I read this book back in February. Saturday by Ian McEwan. Another excellent book by McEwan. See my comments on this book from back in May. Now I have to say that there were quite a few books that almost made it into the top 5. Including Kazuo Ishiguro's Never Let Me Go which I read in May; Harry Potter and the Half-Blood Prince which I devoured in August; and finally Housekeeping by Marilynne Robinson which I just finished. All in all, it was a good reading year. I read less than half of the books on my 2005 reading list, but that's how it usually goes. My reading habits are very organic and usually take unexpected twists and turns throughout the year. I didn't read much non-fiction this year, so maybe that's something I should focus on in 2006. Now comes the fun part! Making the 2006 reading list! Any suggestions? Getting ready yo unfold the first one! You all know how to make these, right? Buy some super cheap coffee filters, mine came in a package of 100 and were less than $1 at Target. 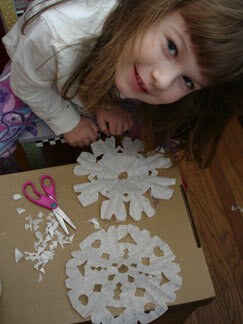 Fold them in half a few times and then snip off some bits here and there. Unfold and you have snowflakes! OMG! Look what came in the mail today! 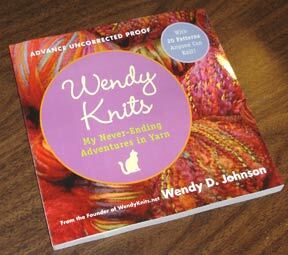 An ARC of Wendy Knits !! I'm so excited! I'm off to read it now. . .
A girl after my own heart. 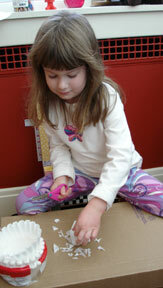 . .
She's crafting! Can you tell what she's doing in this picture? 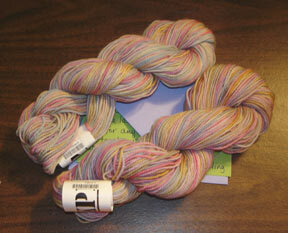 If you guessed French Knitting, or Spool Knitting, you are correct! I didn't think she was old enough for this yet, but her Farmor (father's mother, or paternal grandmother in Swedish) bought it for her for Christmas and she was great at it! I was so proud. . . and so was she. . . I had never heard this referred to as French Knitting, but I see after searching around a bit on the net that it is commonly called that. It's also called Corking or Knitting Nancies. Here is the kit Farmor got for her. 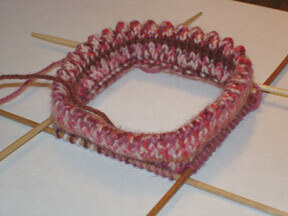 French Knitting Reels -- how to make your own knitting reel. 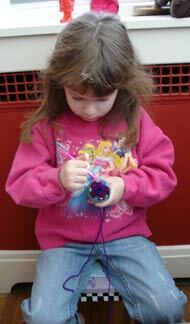 How to use a knitting spool -- photos showing how to use the spool. Corking -- A book that tells you how to make corking toys, as well as what to do with all those knitted cords. 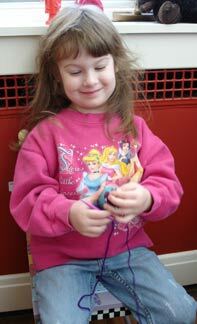 Spool Knit Jewelry -- a Klutz kit for the slightly older child. This one looks like fun and includes everything you need to make bracelets! And now I'm off to Marshall Field's to see Santa and eat by the big tree in the Walnut room! And here's our smorgasbord (did I spell that right, Pete?) Swedish Christmas is heavy on the meat and starch. From top to bottom we have: traditional rice pudding with lingon berries, jello salad, Swedish meatballs, potato sausage, ham, scalloped potatoes, limpa (Swedish rye) and cardamom tea rolls. 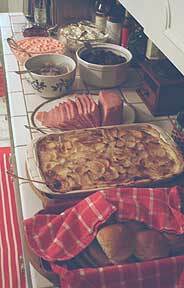 Before dinner there were lots of snacks including Bond-Ost (a caraway seeded cheese) served with knacke bread (hardtack -- like rye krisp kind of). Oh -- and Sil (pickled herring). And of course there was glogg! Glogg is a mulled red wine that you drink warm and it is so good! The next morning we had cardamom braid and coffee cake from the Swedish Bakery -- yum! It was lovely to have Pete's mom here for a few days and Pete was wonderful (& so was Maddie). 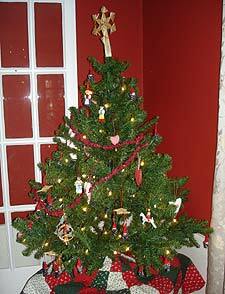 I will leave it at that, other than to say that I will not be having Swedish Christmas here next year. I'm glad that I did it for Pete's mom's sake though. Maybe her daughters will step up next year. Swedish Bakery -- I had to have all the baked goods shipped to me from Swedish Bakery because there was bad weather the day we were supposed to go up to Chicago. Everything arrived here in great condition -- well packed and fresh! You can see pictures of most of their baked goods on the website. I ordered cardamom braids, Andersonville coffee cake, limpa, cardamom tea rolls and cinnamon bread. Yum! Wickstrom's -- Wickstrom's is also in Andersonville (in Chicago) and they are a Swedish deli. You can get the Bond-Ost, Knacke Bread, Sil, Glogg mix and tons of other things. I haven't ordered online from them, but I have shopped there in person and they are wonderful! A while back I bought The New Crewel by Katherine Shaughnessy of Wool & Hoop fame. I had been to her site before and when she came out with this book, I knew I had to have it. Back in the 70's I remember doing the little crewel embroidery kits my mom would let me get from the local craft store. It seems that they went out of fashion and modern designs were not to be found. Then comes The New Crewel , Wow! Shaughnessy has taken this craft and brought it totally up to date with her hip modern designs. 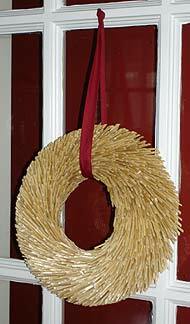 It got me thinking about crafts, which is what brought on the craft post from the other day. Sometimes I feel like I am stuck in a rut and I have to try something different. This book kick-started me and I'm all excited about crafting again! I went and purchased this kit from discountneedlework.com and they shipped it out quickly. I got started on it last night. . .
Yeah, it's a very traditional design, but there is something in me that loves the very traditional. More to come. 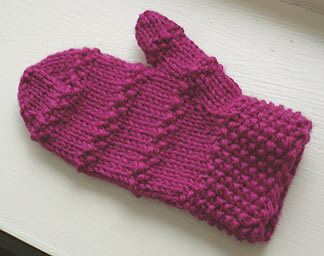 . .
A gallery of projects from New Knits on the Block . Losing a tooth is a big deal in a little kid’s life. Make saying “bye-bye” to baby teeth an out-of-this-world experience with these cool Alien pillows! Oh and when your child asks you if there’s such a thing as the Tooth Fairy, just tell him or her not to worry; the tooth is out there. In the land of pint-sized superheroes, the right attire is essential for crime fighting success. This vibrant, cotton cape will keep your favorite little protector both cool and collected under the pressures of battling the bad guys. Knit it up as shown, or make a wool version to keep your caped crusader warm on even the chilliest of adventures! This nap sack is perfect for a sleepover or nap time. The luxurious cotton chenille, coupled with its handmade goodness, will keep your child feeling cozy whether at home reading a book or away at day care. As a child I sooo wanted to be a mermaid. They are princesses of the undersea with their graceful movements and their long gossamer hair trailing in a slow wave motion. And I grew up in what you would call a “Koi family” . . . that is, our family was and IS really IN to Koi fish (fancy Japanese Carp); complete with clubs, competitions, and endless talk of Tancho’s, Kohaku’s, and Ochiba’s (Koi varieties). Also, as fate would have it, I have only water signs in the significant places of my astrological chart. So with all these water influences, it doesn't surprise me that the theme has crept into my knitting designs. 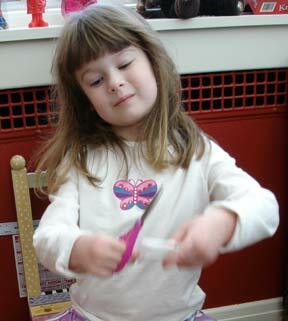 When we’re building or fixing something in our house, the kids always want to “help” by grabbing all of the tools. In effort to keep sharp metal objects out of their hands, I designed a softer set that they can hold in their own personal tool belt. Although it’s doubtful that they’ll stop going after the real thing any time soon, at least they’ll look extra-cute doing it! My little strikers love to bowl! So much so, that I’ve often contemplated constructing an alley in my apartment. I decided, however, that a better idea would be to knit up a toy bowling set that’s durable enough for the kids to play with during the day, and soft enough for them to cuddle up with at night. 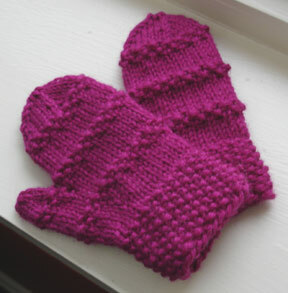 Excerpted from New Knits on the Block , by Vickie Howell. © Vickie Howell 2005-2006, used with permision from Sterling Publishing Co. Inc.
You can see Vickie's post from yesterday over at LollyKnitting Around. And tomorrow she will be stopping by Scout's Knitted Swag. You can see all the stops on her tour here. Thanks for all the great crafting suggestions! I have added quite a few to my list. 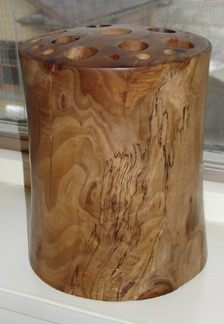 I'm sure you'll be seeing some new projects of all kinds on the blog in the coming months! Speaking of new projects. 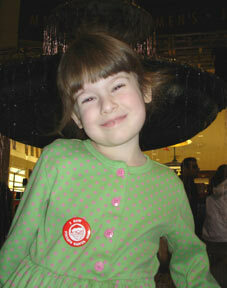 If you remember, I received a great backtack II embroidery kit from my backtack buddy Joelene. I tried out a design from the Stitch-It Kit a few weeks ago. Unfortunately I scorched the fabric when transferring the design. On top of that, my stitches were pretty wonky, seeing as how I was taking massive amounts of codeine at the time. So last night I pulled everything out and decided to try one of the cute owl transfers she included. I was much more successful! I think when I finish this I will make a little quilted pillow or something with this at the center. Anyone know where I can get some cute owl fabric? And since I am the book girl (I originally typed lady -- but it sounded so old!). . . I have to tell you about the Stitch-It Kit & the Embroidery Stitch Bible , both of which I am using to make my little owl. The Embroidery Stitch Bible has a *lot* more stitch in it. So once you learn the basics, you will want this book. I just remembered that I actually reviewed this book back in August. I had checked it out from the library, decided that I had to have it and then went and bought it. I'm glad I did. 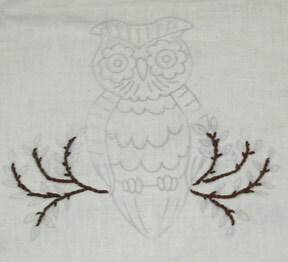 Up next -- Crewel Embroidery! 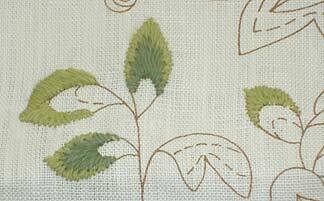 I have a kit on it's way from discountneedlework.com that I am hoping will arrive today! And tomorrow Vickie Howell will be stopping by on her book tour. Come see the great gallery of photos from her book! I am an insatiable crafter. I have tried almost everything. Seriously. I am positive that there are things I have forgotten. 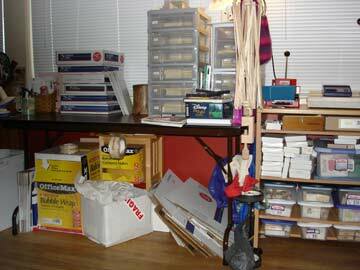 In fact, I have all the supplies for lino printing & stamp making sitting on one of my work tables. And what crafts have you all tried? Show me a list on your blog!! 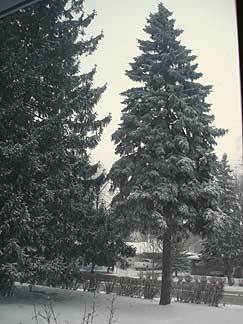 We have two *huge* fir trees in the front yard and I love how they look covered in snow. 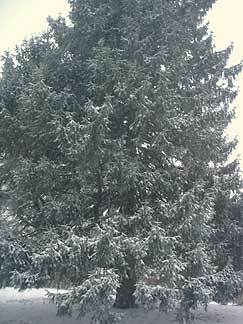 Up top is tree 1 and here is tree 2. . .
We are supposed to get 4-5 inches south of Chicago where I'm at and having just shoveled our drive and walkway, I can confirm that we have already gotten a couple of inches. Here's a shot of my "kitchen" garden this afternoon. . . 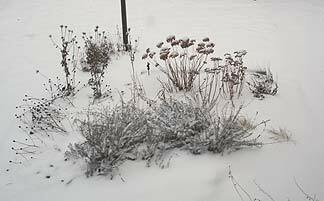 I like to leave the stems because I think they look very cool in the winter all covered in snow. And tonight is the Stamping Online / Black Sheep Bags Holiday Party! I told Maddie this last night and I also told her that daddy couldn't come. She looked at me incredulously saying -- He can't come? You mean you won't let him into the house? Yep, I said. It was hysterical -- she couldn't believe what she was hearing! In actuality it is Pete's company Christmas party tonight and he always jokes that Maddie and I hold our company party the same night. Ours will be much tamer than his if previous years are any indication. See, Pete works for this real estate company in Chicago headed by a huge real estate tycoon (he's like the Chicago version of Donald Trump.) And every year he throws a *bash* for his employees with his own money. At these parties there are sometimes exotic dancers dancing around in their skivvies -- I kid you not!! Needless to say the spouses are not invited. I've seen pictures though and it is wild. In contrast, Maddie and I will be hanging out, eating Mac & Cheese and relaxing. We already had our outing to the bookstore earlier in the day in order to avoid the snowstorm. Time to go knit! Yesterday morning I finished A Million Little Pieces by James Frey. I literally couldn't wait to read more of this book every day over the past week. Frey's real life story of his battle with alcohol and drug addiction fascinated me. Believe it or not, I really related to his story. The book starts with a nearly comatose Frey coming back to consciousness in an airplane with no recollection of how he got there. His parents then take him into drug re-hab and he has to go through de-tox followed by some brutal dental and medical procedures. As the book progresses Frey comes to terms with his addiction and conquers it. Frey's style, which lacks 'proper' punctuation and capitalization, adds to the book rather than detracts from it. He puts you right into the moments that he lived through. You get so caught up, that it's really difficult to set the book down. So what am I reading now? Well, first I have to tell you that I have the *best* husband. Knowing that I was feeling miserable with this cold, he went to the library last night and got Everything is Illuminated by Jonathan Safran Foer for me to read. (I recently finished Extremely Loud & Incredibly Close and really liked it and I heard this one was even better. We shall see!) And he also picked up Housekeeping by Marilynne Robinson, the author of Gilead , which is supposed to be an excellent book. I'm reading it next. One final book item. . . has anyone read Wicked by Gregory Maguire? I'm thinking of getting it for my Grandma for Christmas. She usually reads Danielle Steele, Anne Rivers Siddons etc. Do you think she would like Wicked? This week is the Vickie Howell Blog Tour for her new book New Knits on the Block. She's going to be stopping be here on Sunday! You can see the entire list of sites she's visiting here. Don't know who Vickie is? She hosts Knitty Gritty which I have never been able to see since my local cable doesn't include DIY. But the projects she does on the show are available online which is cool. And if you remember, a few weeks ago I finished the Princess Hat from her new book. So stop by on Sunday and check it out! Thanks for the Cold Remedies! Thank you everyone for the great cold remedies! I've been sipping tea with honey and lemon and getting rest and I'm feeling a little bit better -- but very tired. The trip for tomorrow has been canceled and rescheduled for later this month. Maddie was very grown up and understanding. I'm going to try many of the things that were recommended! Although it appears that some of the best remedies need to be taken at the very first sign of a cold which was Sunday -- missed the boat there. Speaking of remedies -- you can't get cold medicine off the shelf anymore. Darn meth lab people. I had to wait in line at the pharmacy as if I were getting a prescription -- doesn't seem like a very good use of a pharmacists time, but I guess it has to be done. Time to go lay in bed again and veg out. . . I'm sick -- have a remedy? So anyway, I guess having surgery probably weakened it a bit more. . . then the freezing cold weather arrived. 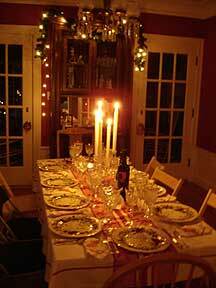 . . and the busyness of the holiday season. . . and now I have a nasty little cold. 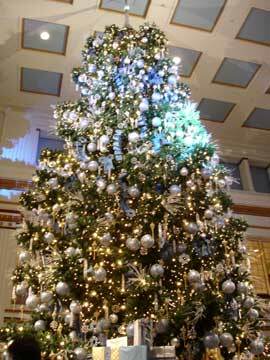 We are planning to go to Marshall Field's to eat by the big tree in the Walnut Room tomorrow and I feel like, well you know what I feel like. So tell me your remedies! Your quick fixes! What you do to get you through when you have the sniffles, a sore throat and are oh so tired. I need help here people! I have a 5 year old that I do not want to disappoint! All about the Dala Horse. Interesting new knitting books coming out soon ! 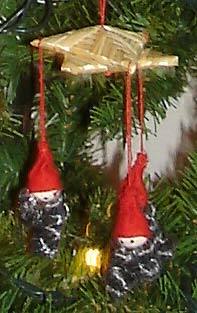 Post about Swedish Christmas traditions. So you can see, I have lots of ideas -- but little time for execution. I really want to tell you / show you about the Dala horses because I really love them. Maybe tomorrow! Well, I'm all healed from my surgery and it's time to report back on my books to recuperate by. I finished Watermelon by Marian Keyes & Extremely Loud & Incredibly Close by Jonathan Safran Foer and gave a short report on them here. I didn't even pick up either Bait and Switch by Barbara Ehrenreich or The Polysyllabic Spree by Nick Hornby -- guess I don't like to recuperate with non-fiction -- so I'm still mid-way through those. And I just finished White Teeth by Zadie Smith last night, so I better give you a report on that. . . I really enjoyed White Teeth -- it was a leisurely read that was filled with lots of great characters and some hilarious writing. I can see why she has been called a rising star and I'm now eager to read her latest -- On Beauty . White Teeth seems to fit in well with the overriding theme in a lot of the fiction I've been reading over the last year or two -- the struggles of 1st and 2nd generation immigrants. Many of these novels seem to be set in London, as is White Teeth. Maybe this is just the popular genre of the time, or maybe I've just fallen into the habit of picking up books of this type, I'm not sure. But I find them extremely enjoyable and often insightful. I would give you a plot summary, but this book is truly epic and I don't know where to begin! It's a great read and if you are willing to devote the time to it, I think you will enjoy it and come away with some insights too. Up next is A Million Little Pieces by James Frey which I started at midnight after finishing White Teeth. Let's just say that I had to force myself to put it down at 1 am -- now that's a good sign! It's even nice and neat on the inside, don't you think? Surprising since I was up past midnight knitting these. I swear it was like reading a great book -- I just couldn't set it down. Picot edgings are fun! Now I only hope sock #2 turns out the same way when I get to it. I did take notes, but I have notoriously bad handwriting and often lose my notes as I have 5-6 project notebooks floating around at any one time. 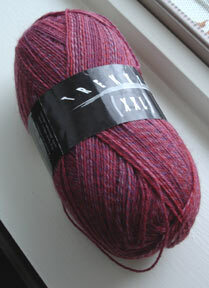 Oh and for the curious, that's Regia Jubilee colorway 5472 -- pinks and browns -- what could be better? New Knitting Magazine -- Knitting Fog! There is a new knitting magazine that is just starting out called Knitting Fog and I did an interview that they have posted! It's mostly about knitting blogs and the knitting blogs web ring. (Be kind! I was still recovering from surgery and taking codeine when I gave my answers to the questions!) They also have their first free pattern available online.